You can save a scanned image to your computer as a PDF, searchable PDF, or JPEG file. Make sure your originals are scanned and reviewed. See the link below. The document type and scan date for the file name are automatically detected. You can change them as necessary. 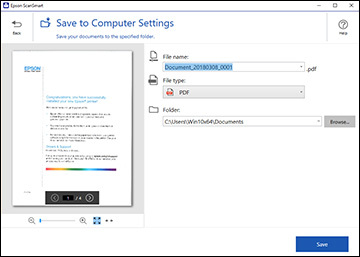 You can save the scanned image as a PDF, JPEG, or searchable PDF file. If you select searchable PDF, you can select the OCR (Optical Character Recognition) language. Select the folder on your computer where the document is saved.